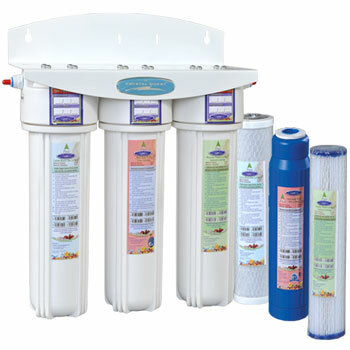 Dimensions: 15" x 14" x 5"
Triple Undersink Water Filter, an 8-Stage three cartridge filtration system by CRYSTAL QUEST(Also known as Mega 3000). This Under Counter Water Filtration System saves kitchen counter space and employs 3 cartridges for filtration: (a. 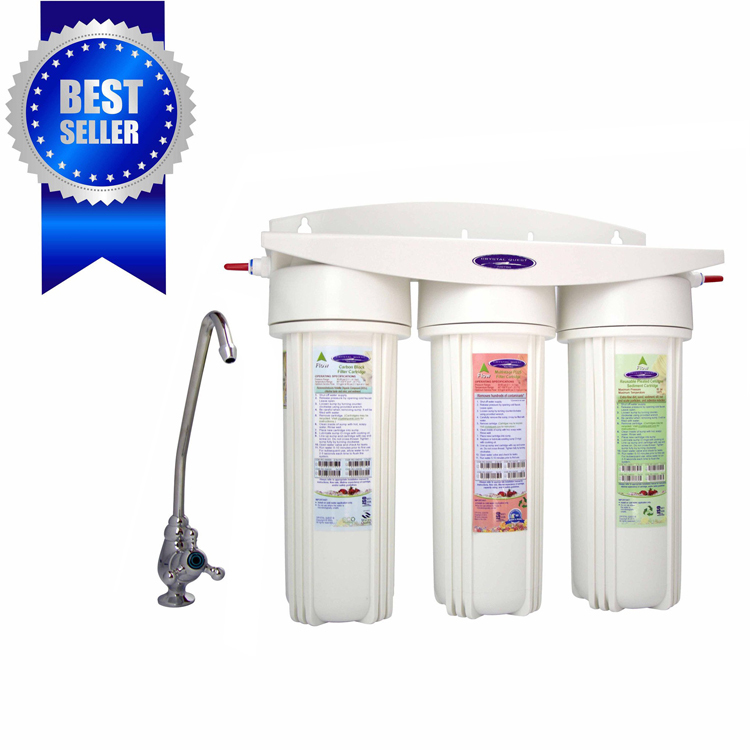 )multistage cartridge-solid state water filter that uses the latest technologies in blending the adsorption capabilities of coconut shell activated carbon(GAC) with Eagle Redox Alloy, (b. 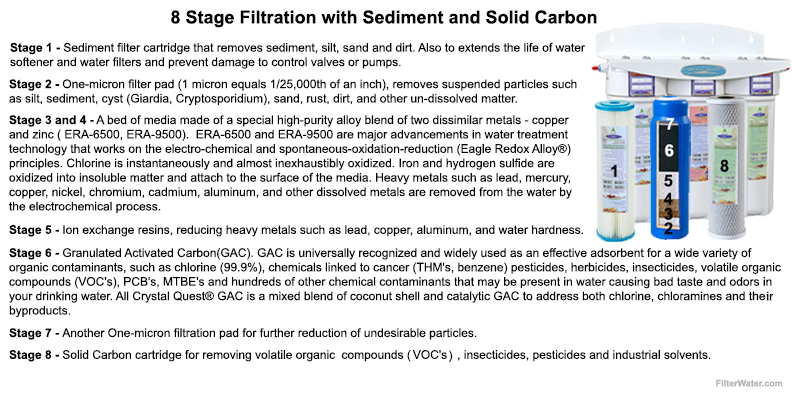 )sediment filter that removes sediment, silt, sand and dirt and (c.)a solid carbon cartridge for removing Volatile Organic Compounds (VOC's), insecticides, pesticides, and industrial solvents). 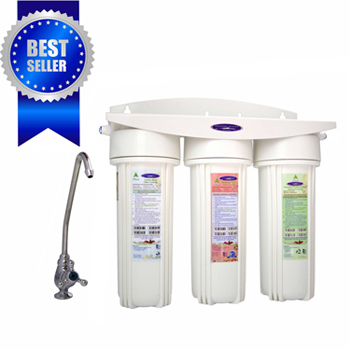 Its 8-stage filtration process eliminates hundreds of impurities from tap water giving your family a continuous supply of pure, great tasting and healthy drinking water. The perfect solution for any household, apartment or office. Quick, easy to install and use! 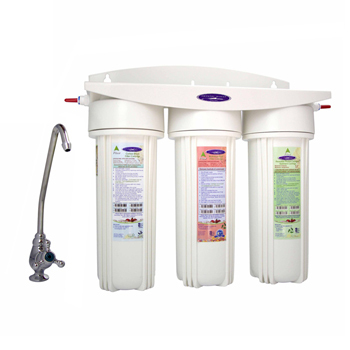 The whole system is attractive, convenient and effectively removes many contaminants from water. Can also be installed on refrigerators/ice makers(requires this optional hook-up, sold separately). Installs neatly under the sink. Comes with an attractive faucet and all necessary installation hardware. Conveniently provides years of filtered water(depending on configuration). Combination of Sediment, Solid Carbon, Coconut Shell/Granulated Activated Carbon and Eagle Redox Alloy® filtration. - System comes with a faucet, 1/4" water line to connect it to supply, and installation hardware. - On installation, if current under sink plumbing is hard copper tubing the saddle valve would be used; for flex tubing the T-valve would be required. Please specify in Notes on the Shopping cart screen at checkout if you have a preference, otherwise you may get one or the other. The product is really good quality, very easy to install. The company has a great customer service. I recommend this product, very much!